My dolphin in d/games/dolphin folder ı tried c/user/username/documents/dolphin emulator and d/games/dolphin/user (I created user folder) folder for texture packs and nothing. It worked for me with my textures. 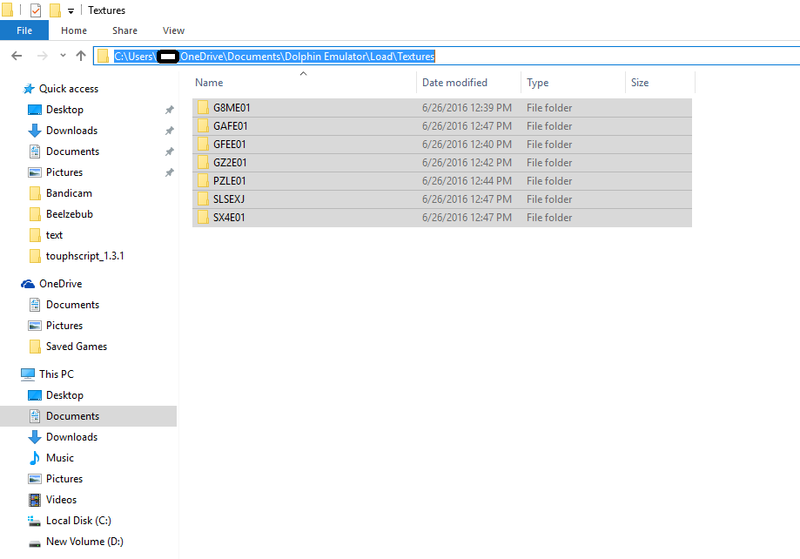 Check GameID and folder locations . sorry for flood but problem still going. What game is this for? Do you have Graphics > Advanced > Load Custom Textures checked? Can you show us a screenshot of the Load\textures folder? actually dolphin 5.0 load my custom buttons for each game. Like xenoblade chronicles, mario galaxy etc but dont load texture packs. Edit: I tried xenoblade chronicles and hd textures loaded. I redownload other hd textures. I think it might be the OneDrive then. I recommend downloading a development build, extracting it somewhere, putting a "portable.txt" next to dolphin.exe, then launch. A "User" folder will be created in the Dolphin folder, allowing you to put textures in there. ı think the problem is texture packs. Because xenoblade hd texture working but twilight princess not work. I should ask for twilight princess hd texture creators this issue. (06-27-2016, 11:07 PM)drgn Wrote: ı think the problem is texture packs. Because xenoblade hd texture working but twilight princess not work. I should ask for twilight princess hd texture creators this issue.